So, you have a website, you have been beavering away building links, submitting to directories and more to improve your SEO, you may have even looked into the top 3 tier search engine PPC platforms, now what? How do you measure your performance? How do you improve your performance with limited benchmarks? How do you cook an ommlette without breaking an egg? The answer to all of these questions (ommlette aside) is Analytics. In a nutshell, Analytics can be defined as, “the reaching of a decision based on an existing dataset”. By looking at data across various channels and mediums, you can then determine the performance of your site/strategy (you do have a strategy don’t you?) which can then inform your decisions. In this digital age, having an online presence is almost completely necessary to increase your chances of retiring with pockets full of money. Analytics can help you in defining goals, increasing your success and whether you need to plan for 2 yachts or your own airstrip. Sounds Good. Where Can I Get Analytics From? For this series of Becoming a Data Ninja, we shall be looking at the most potent free version of Analytics which is of course Google’s offering – Google Analytics. 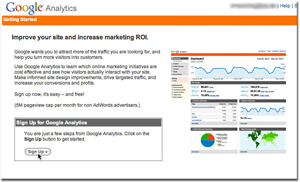 Complete with a catchy name, Google Analytics is the most complete free Analytics tool that we have seen. Whilst there are arguably more complex tools out there, they are not by any means cheap. I Want My Yacht! Get Me Started! ï»¿Clicking on that will give you an option to sign up with your current Google Account (Perhaps the one you used to setup your Adwords account) or if you don’t have one, then from here you can create a new one. 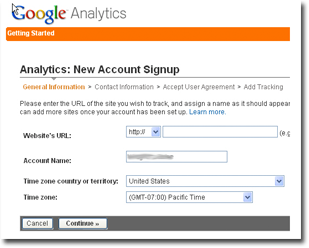 Once you have created your account, or signed in, you will be presented with a screen to then Sign Up for Analytics. Next up is Google’s Terms Of Service. If you want to spend a long time reading the T&C’s then go right ahead, we will still be here when you get back. If you don’t want to read all of that then pay particular attention to the Data Sharing option. Google will by default opt you into this. What this means is that Google will use data across similar sized websites in the same industry as yourself, in order to then present you with a comparison. If you are not worries about having this sort of comparison, then untick the box. The next stage requires you to go and put on your web developer hat, or hand this part over to your web dev team. If you do not have one, and you are not sure then give us a call! We offer a Google Analytics installation service which will take any worries out of your hands. Where you put this code depends on the type of website you have. Essentially the code needs to be entered into the <head> section of your website. This has changed from the previous installation method of adding the code to the footer, so make sure your web dev team is adhering to the latest Google standards. Providing the installation was correct, you should be seeing data 24 hours later, coupled with a green tick in place of the yellow triangle. In the meantime you could plan where you are going to moor your yacht, or look at expanding your marketing efforts, perhaps with a superior PPC setup, or some SEO magic from us here at Sleeping Giant Media. Next up in this series will be understanding the dashboard and adding users. As usual we heartily welcome your comments and if you have any questions, or wish to receive advice on any aspect of Search Marketing, our ears are always open.